A weak mid-latitude system will make a pass today, bringing rain and thunderstorms, with a chance for storms to be severe. The below map shows a widespread slight risk for severe thunderstorms, which means these storms might have low coverage and varying intensity. The main threats for this day are wind and hail damage; nevertheless, a tornado is always possible. These storms may have the largest impact for the afternoon and making a pass through the eastern parts of Kentucky and Tennessee for the evening. Highs for Sunday in Bowling Green can reach the mid-upper 70’s, and lows in the mid 50’s. For Monday, there will still be morning showers, but it will remain cloudy for the rest of the day. Highs can reach the mid 70’s, and lows will be in the upper 50’s. Tuesday could be cloudy as well, with some clearing for the afternoon. Highs will be in the mid 70’s and lows in the lower 50’s. If you are out driving this morning, please take care and precaution, for there will be fog for the Saturday morning commute. 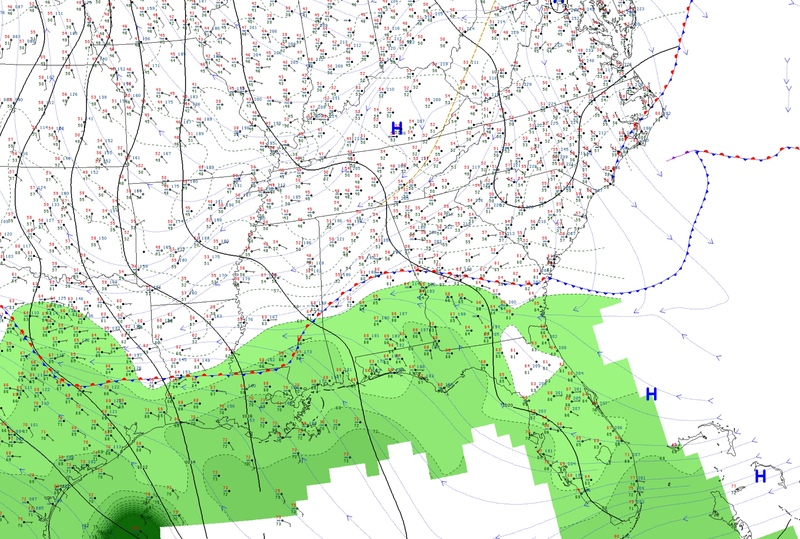 Otherwise, enjoy a sunny day, for a high pressure field centers itself just over Kentucky. Highs for Saturday will be very enjoyable in the mid-lower 70’s, and lows will be in the upper 40’s. Sunday will see some storm action, and severe weather may return to the mid-South. These storms might be the most intense for the afternoon hours of Sunday. Highs for Sunday could be in the mid 70’s, and lows could reach the mid 50’s. Monday could see similar patterns in the morning, but then it might clear up for the afternoon. Highs for Monday will reach the upper 70’s and lows will be in the mid 50’s. Bringing Back the 80s and We’re Not Talking About the Decade! We were definitely socked in the clouds today and we won’t be breaking out of them for at the least the overnight hours as some higher clouds, represented by the brighter colors in the imagery, start to move in from the west. 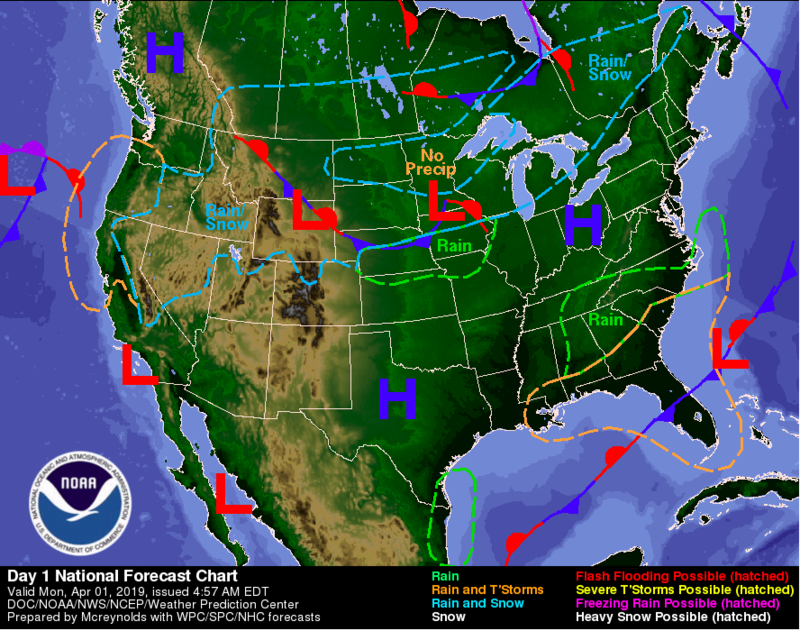 A stalled out frontal boundary to our south with start to lift northward as a warm front throughout the day tomorrow helping to usher in some much warmer temperatures as well as moisture content. Most of the day on Saturday remains dry. We’ll have to watch out for scattered shower chances out ahead of the approaching warm front. By Sunday we will be well established in the warm sector. Depending of how much sun we will see, storms could be a possibility Sunday evening out ahead of a approaching cold front from the west. Temperatures on Sunday will be flirting with the 80 degree mark for the first time this season! 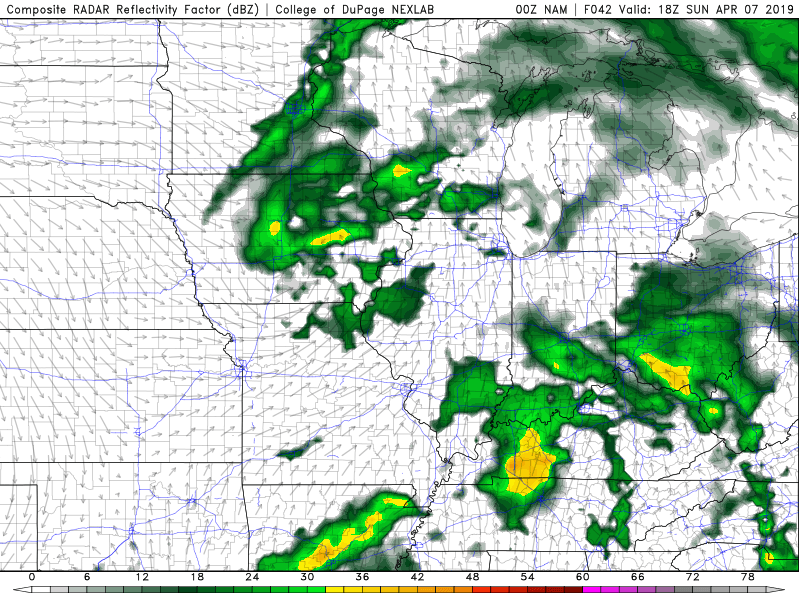 Some of the storms on Sunday could be strong to severe if the instability is able to establish itself over the region. Confidence for strong storms is low at this time. Here is the 0Z(7 pm) run of the NAM model’s depiction of how Sunday COULD unfold. 0Z NAM Simulated Composite Reflectivity valid for Sunday morning around 4am CDT. Showers possible early Sunday morning ahead of that warm front. The showers should clear out shortly after sunrise keeping a small part of the day dry. Showers and storms return, however, by early afternoon. 0Z NAM Simulated Composite Reflectivity valid for Sunday afternoon around 1pm CDT. Shower and storm chances hang on for the start to the workweek as another system approaches from the southwest dragging across the TN Valley through the day on Monday. Tonight: We hold onto the clouds overnight with lows falling into the low 50s. Calm winds. Saturday: Partly cloudy skies with temps in the upper 70s across the region. Winds light out of the SW.
Saturday Night: Scattered showers late with lows staying in the upper 50s. Winds light out of the SW.
Sunday: Showers and thunderstorms likely. Temperatures in the upper 70s to low 80s. Winds out of the S at 7-13 mph, gusting at times to 23. Posted in Kentucky Weather	| Comments Off on Bringing Back the 80s and We’re Not Talking About the Decade! Rain Chances on the Way! It has been a beautiful start to the week! Warm temperatures and sunny skies made for quite a nice past few days. But here comes the rain again! With the pleasant weather as of late, tree pollen has been pretty high. For all those with pollen allergies, Thursday night will be a relief! 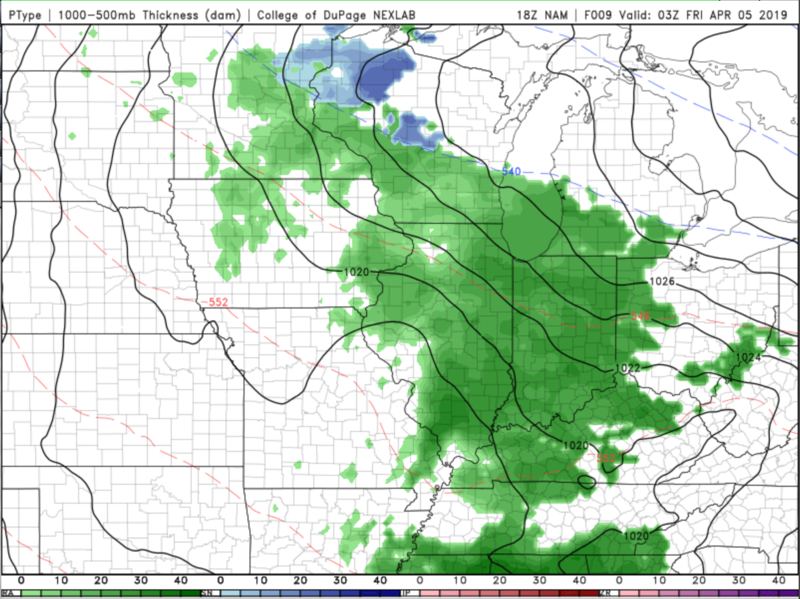 Models (such as the ones posted above) are all in agreement with a pretty decent rain for this area Thursday evening into Friday early morning. A good night to sleep with the windows open! Before the rain, Thursday will be warm again! We could see temperatures climb to the lower 70s before the rain arrives in the evening. 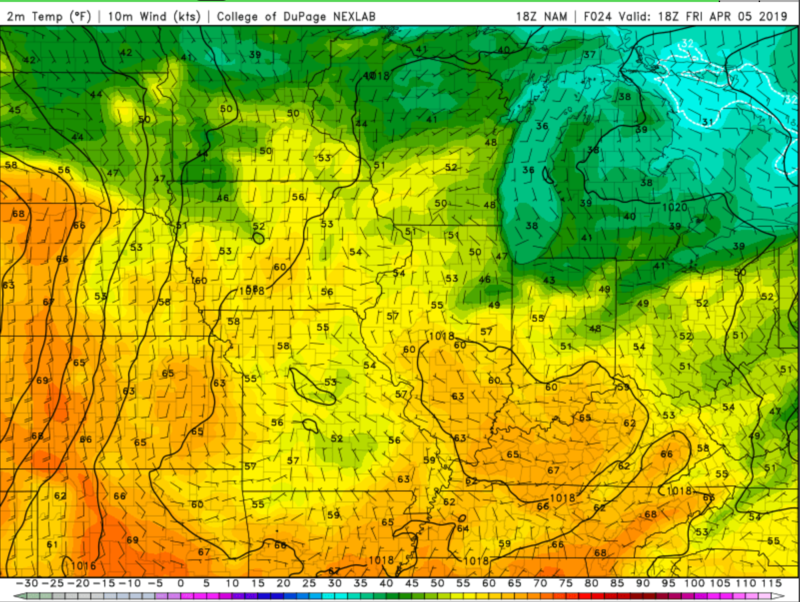 However, as the model above is hinting at, cooler temperatures are expected for Friday following the rain. 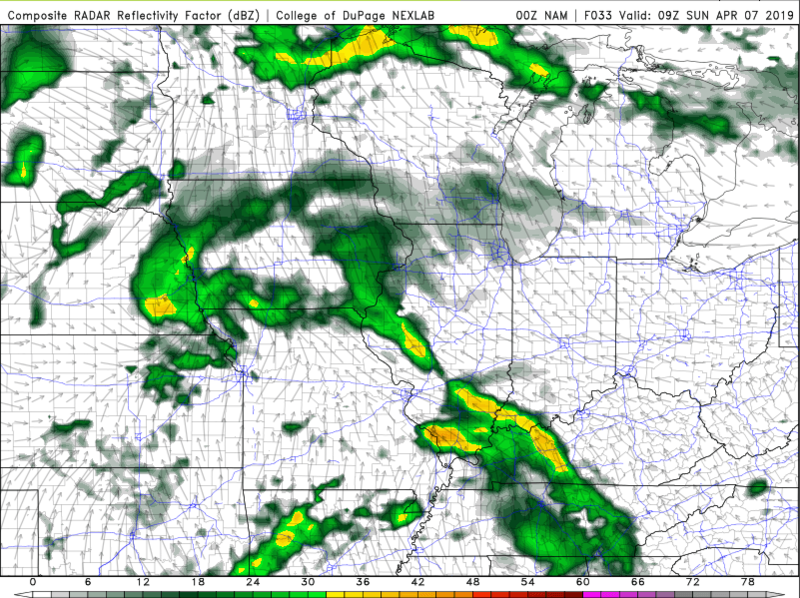 There could be a chance for a few thunderstorms this weekend, so be sure to stay up to date with the latest from our blog! 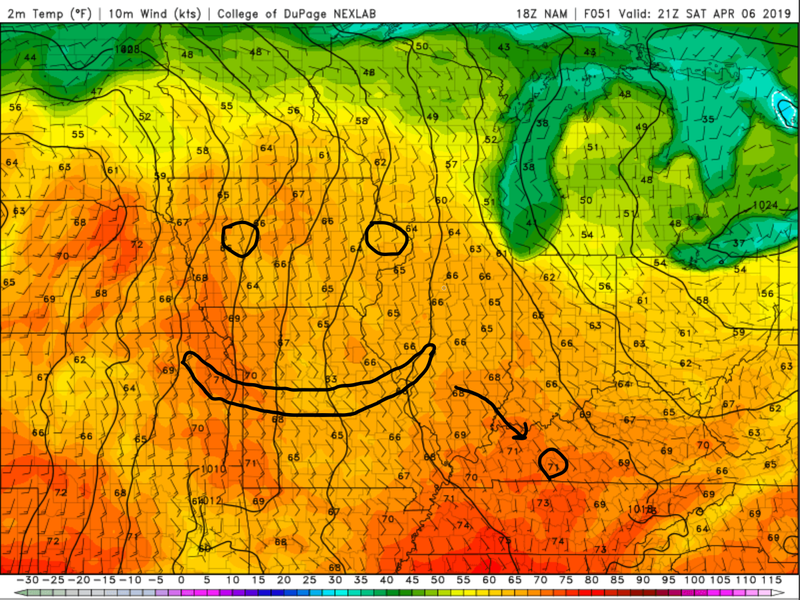 Posted in Kentucky Weather	| Comments Off on Rain Chances on the Way! Good afternoon everyone! I hope you all are enjoying this gorgeous day as temperatures hit 60° and flowers are in bloom. 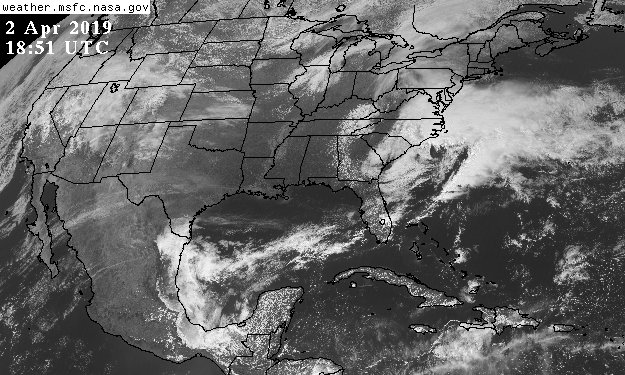 Satellite imagery shows little to no clouds around the area. Thankfully we still have tomorrow to enjoy the weather before a cold front moves in with rain and possible storms. Rain will arrive for Thursday with the majority falling in the afternoon hours to Friday morning. Most of the models have a quarter to half an inch which looking at the data I would agree. 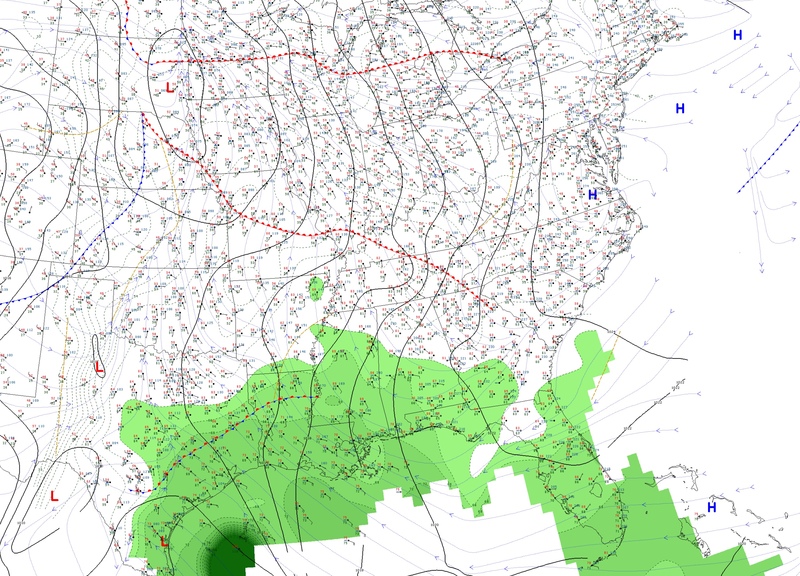 Precipitation: 1/4 to 1/2 inch of rain with most of it falling in the afternoon and at night.